The author presents a comprehensive history of a line opened in 1854, a short portion of which remain open for freight traffic today. The railway from Princes Risborough to Oxford via Thame, was part of the Wycombe Railway, from Maidenhead to Oxford. Once the line was open to High Wycombe (1854), thoughts very soon turned to extension, first to Thame (1862), and then Oxford (1864). 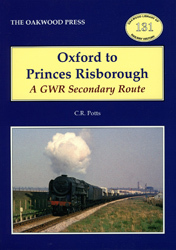 For many years the entire railway was run as one section – Maidenhead-Oxford – just as intended when it was built, but early in the 20th century the GWR started treating Princes Risborough-Oxford as a separate branch. The line was also used as a secondary route, as it provided an alternative link between Oxford and the capital, resulting in an interesting variety of motive power. The station at Thame is noted as a fine example of a Brunel train-shed roof that survived until the end of passenger services. The line is strongly associated with the Morris Motors and Presses Steel Works at Crowley. The works were to play a huge part in assisting the war effort and there were frequent expansions of the railway facilities inside the works. A5 format, 256 pages, over 180 illustrations.